In 2013, I heard Horace Dediu describe Google's business model using the analogy of catching fish with a net at the mouth of a river. To me, it's still the best simplification of why Google and parent company Alphabet do what they do. 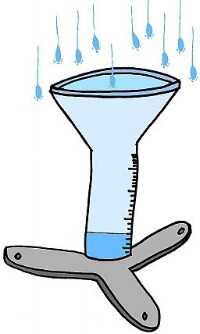 ...then measure and monetize the results. This clear line is the result of Google being the main benefactor of one of the most efficient profit generation machines in history: search advertising. Search advertising is such a powerful revenue generator that it's impossible for Google to put all those resources back into improving the search experience. Leadership is forced to think creatively to grow the business. You could interpret the results of these creative pursuits as vanity projects funded by an out of touch Silicon Valley behemoth. But, many argue that these endeavors are actually shrewd business decisions that focus on feeding the proven business model of search advertising. In 2013, I had my mind blown while listening to Horace Dediu's podcast "Critical Path". He described a brilliant way of thinking about Google's business model. At the time, Alphabet wasn't in the picture yet but his analogy holds true today in 2018. The segment is about 15 mins long, listen starting here at the 33 minute mark as the co-host introduces the topic. Imagine a river, in the river are fish. At the mouth of the river, right before it empties out into the ocean, there are nets thrown across the river catching all the fish. If the goal is to catch the most fish. One approach is to increase the amount of water in the ecosystem upstream that's headed toward your nets. If there was a lot of rain, the river would flow higher and faster. Figuring out how to make it rain on command would mean your nets would fill more quickly with fish. The nets at the mouth of the river are the Google Ads shown to people searching. 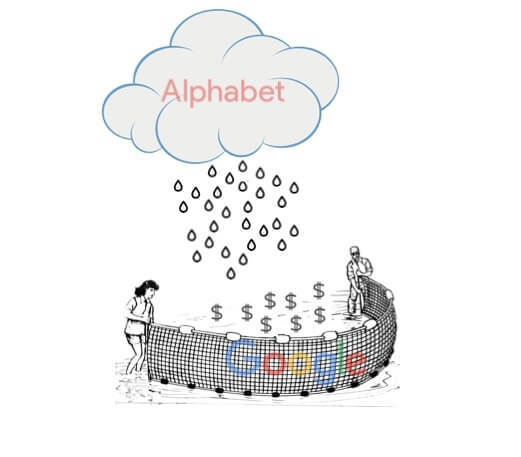 How Alphabet "Makes it Rain"
The more time people spend online, the more searches they will perform. It is a beautifully simple formula for Alphabet to focus on. This means for Alphabet, increasing access to and the speed of the internet is making it "rain" in the analogy. - Free access to super fast internet: Google Fiber. - Remove barriers that prevent a person from using the internet: autonomous cars. - Offer an operating system that can run the internet on slower networks: Android. These are audacious undertakings. But Alphabet is forced to take big swings because they essentially have the task of growing internet use across society. When you think about Alphabet as an ecosystem designed to funnel people to search on Google, then it doesn't seem so crazy that they'd be dumping so much energy and resources into a project like building an autonomous car. If you are driving, you have your attention on the road and you aren't able to search Google for information and scan a screen with ads. Lots of people spend hours a day in their car, that's time they could be Googling something.